Pictured from left to right: Barry Broughton, Operations Director; Matt Smith, Managing Director; The Viscount De L’Isle MBE, Lord-Lieutenant of Kent and Mr Jacques Arnold DL who read the citation. (c) Rob Berry. 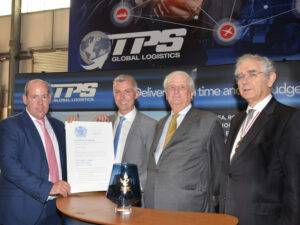 TPS Global Logistics based in Aylesford are proud winners of the prestigious Queen’s Award for Enterprise for a second time. The company also celebrated their 15 year anniversary with 100 employees, customers, friends, family and dignitaries joining them for a formal presentation of the spectacular crystal trophy and a citation from the Lord Lieutenant of Kent, followed by tours of the newly refurbished Aylesford warehouse, offices and distribution centre. TPS Global Logistics Staff at the event enjoying the special celebration. (c) Rob Berry. 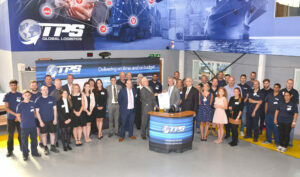 ‘This is a great day for everyone who has contributed to the remarkable success of CRM Logistics Limited, now TPS Global Logistics, founded only 15 years ago. This is the second Queen’s Award for International Trade I have had the pleasure to present to you, and reinforces the high regard in which you are held in the exponential increase in demand for export growth of the business, and exceptional customer care. Today’s event exemplifies achievements, success and excellence. It recognises what is an exceptional accomplishment by any standard. A great deal of dedication and effort by everyone in the team goes into achieving and maintaining the success recognised by this Award. I congratulate and thank each and every person involved in this remarkable success story, for what you have achieved in winning these two accolades and hope your business will continue to grow.